M City condominiums will be a stunning addition to downtown Mississauga's skyline. This master planned community will feature iconic architecture, over two-acres of public parkland and futuristic design. 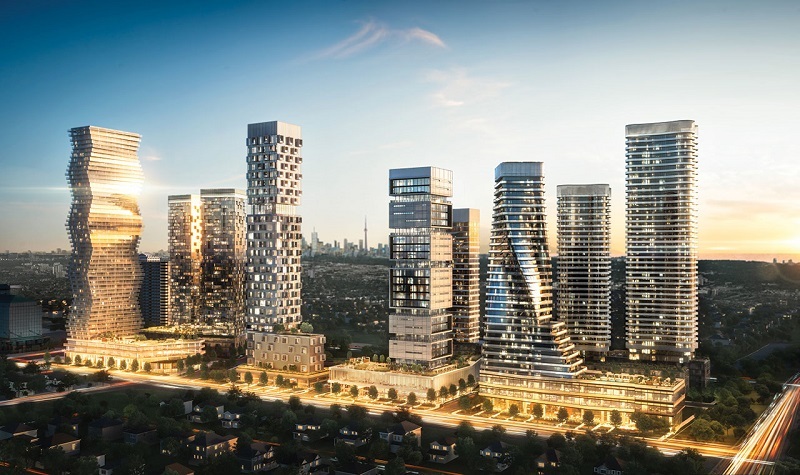 Inspired by Mississauga’s Downtown21 plan, the M City project will include 10 residential condo towers with over 6,000 units on 4.3 million square feet. CORE Architects created a winning design for the first tower that will redefine Mississauga’s skyline with a striking, undulating tower that rotates seven typical floor plates in repetition as it rises 60 storeys. Key community features include extending existing city streets to create a network of blocks, creating a pedestrian-friendly environment. Standard residential blocks will provide two-way roads with street parking, large sidewalks and residential frontages. Two acres of parkland and access to the planned Hurontario LRT along with infrastructure improvements for the anticipated 15,000 residents that will call M City home. Downtown Mississauga properties have a history of fetching good value appreciation. Being in excellent location, these properties are easy to rent. Tenants typically are professional, young families or students. M City will have a range of amenities, many of them family friendly, from the usual gym and party room, to a splash pad and an outdoor swimming pool. There’s also a proposal for a skating rink on the tower’s podium in the winter. easy access to a number of MiWay and GO transit routes connecting all over Mississauga and beyond. Major highways - 403/410, 401, 407 & QEW a short drive away. ... in short an ideal location to live, work and play all accessible by foot. First tower will be launched on March 22, 2017.
or call us at (647) 834-9928.